Looking to volunteer at an event? Check out volunteer opportunities here. 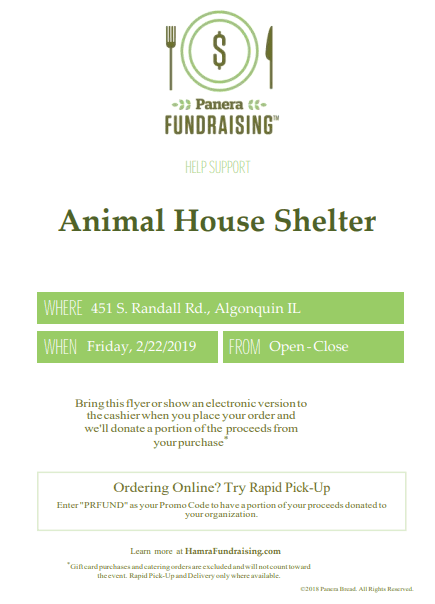 Help raise funds for Animal House Shelter by eating at the Algonquin Panera Bread Location on February 22nd, 2019. SHOW THIS FLYER and eat in or carry out at any time of the day and Animal House will receive a portion of the sale. If you order online, make sure to use the code PRFUND! Thank you to Panera Bread for pairing with us for this event! -You must show a copy of the flier for Animal House to receive a donation. You can print out the flier or show the cashier an electronic copy.